• Reza's basic attacks consume Firestarter, dealing crystal damage. 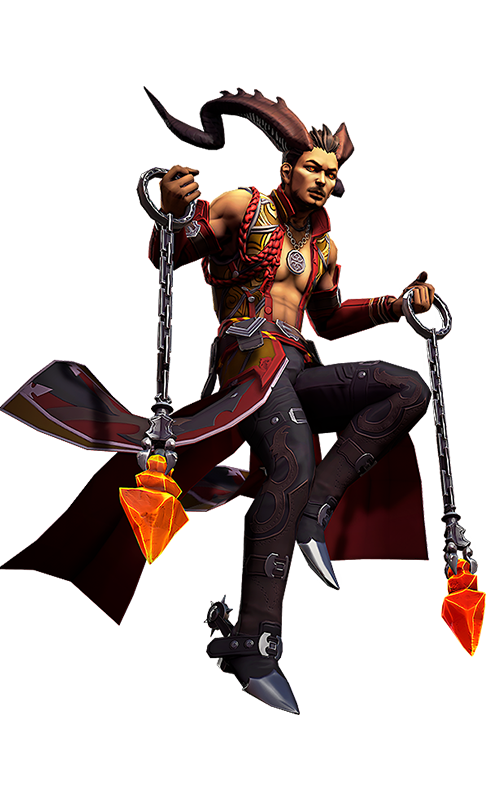 Reza smashes the ground, creating a fiery shockwave in front of him. This deals crystal damage to anything it passes through and collides with the first enemy hero or jungle monster hit. • Scorcher applies Firestarter on impact. • Reza's next basic attack deals bonus crystal damage. • This ability has 2 charges. Reza vanishes, then reappears at the target location in empowered demon form. • Upon reappearing, he unleashes a blazing explosion, damaging enemies and consuming Firestarter within the target radius. • Reza then applies Firestarter to all enemies nearby. • Each basic attack now applies Firestarter on enemies without Firestarter on them.